How good are you at clearing your mask underwater? It might seem like a silly question, but for some people I know, this simple skill is a lot more difficult than it should be. Mask clearing is one of the most important skills you need to master as a scuba diver. Even though it may not seem like a big deal, the ability to clear your mask is crucial. In this article we are goig to give you some SCUBA mask clearing tips that will make you a pro in no time! Something as mundane as a little water in the mask can make you uncomfortable and even anxious. This state can then escalate and make other small issues seem way larger than they really are. Since you have one uncomfortable situation stacking on top of one another, you can turn an otherwise benign problem into something major. Let’s face it, water in the mask is almost inevitable. A simple smile can force the mask seal to break and let water into your mask. Clearing your mask is super-simple to master, once you understand and practice the techniques. Before I begin, let me tell you what I consider to be a successful mask clearing. This may be different from what you are currently doing and it may be part of the reason why you might not be totally comfortable yet with this skill. When assessing this skill in my classes, a successful mask clearing is when you COMPLETELY clear your mask on LESS than one breath. This means you should be able to do multiple mask clears with one breath. Unfortunately many students I’ve had over the years have taken 2 or even 3 breaths to clear their masks. Having to take more than one breath to clear your mask is extremely inefficient. 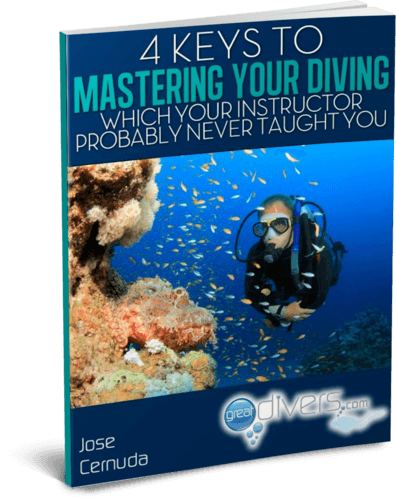 The goal of this post is to help you master mask clearing, so please read on so you can learn more about the tips needed to master this fundamental SCUBA diving skill. Of course, to fully master this you will have to go practice in the water! There are two basic ways to clear your mask. Below is are descriptions of both methods as well as a couple of videos showing you how to perform them. The key to effectively clearing your mask is to understand the principles involved and how to position yourself and your mask to make flushing the water out of the mask simple. Principle number one: Bubbles go up! Before we get into the technique of mask clearing, it helps to understand how it works. Mask clearing works by trapping air bubbles in our mask. By exhaling through our noses and sealing off the top of our mask, we trap the bubbles inside of our mask. This trapping of the air bubbles also forces water out of the bottom of our masks. Principle number two: When air displaces water, the water has to have a place to go. Because we are trapping the air bubbles at the top of our mask, we need to create a gap at the bottom of our mask in order to have a place for the water to go. Principle number three: Head position matters when clearing your mask. In order for all of this to work, you have to have you head on a vertical plane. However, this doesn’t mean that your entire body has to be vertical. Simply looking up while maintaining a horizontal body position will do. So now that you understand the principles, let me walk you through how I teach mask clearing so that you can master it. First off, I relay to my students that they have to be looking up in order to clear their masks. You have to make sure that your face is vertical in the water column. Remember, your whole body should not be vertical, just your face. Secondly, I tell my students to break the seal of their mask at the bottom, you only need a slight opening here, maybe enough to slide your pinky finger in. It is common to separate the mask too far from your face which makes it hard to properly clear the mask. Be mindful of this. Next I tell my student to exhale slowly from their nose. For some people it helps to move their tongue to the roof of their mouth to make sure that they are not exhaling simultaneously from their mouth. As you exhale from your nose you’ll notice the water level slowly going down your face. Once you feel that the mask is clear, continue exhaling slowly and move the mask back against your face top reseal it and stop exhaling. The mask will be clear and sealed! See the video below so you can see how I do this skill. If the above method does not work for you, read below for an alternate method that is also effective. Exhale slowly through your nose while pressing your hand against the top of your mask to force the top of your mask to seal. Once you feel the water is cleared from your mask, press the rest of your mask against your face. Your mask will now be clear! See the video below so you can see how I do the alternate method. The key to making both methods above effective is to EXHALE SLOWLY and ONLY THROUGH YOUR NOSE. Once the water is completely out of your mask, you must adjust the mask to reseal it and stop exhaling. We hope these SCUBA mask clearing tips have helped you. Whichever method you choose to clear your SCUBA mask underwater, make sure you practice and master it. You should be able to clear your mask multiple times on a single breath. Doing so will help to increase your confidence and comfort in the water. I can’t emphasize enough how important it is to be totally comfortable with this basic skill. Not being comfortable with mask clearing can lead to other problems, so be sure to practice, practice, practice! What method do you use primarily and why? I’d love to know in the comments below.